Born in Burma/Myanmar in 1961, Zarganar has spent almost his entire life living in a country ruled by an oppressive military regime. He is a comedian, an actor and a film director and he is also the most celebrated satirist in his native country. 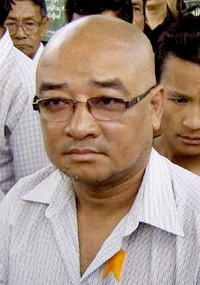 But highlighting the Burmese government’s failure to protect its people saw him sentenced to 59 years in one of the country’s toughest prisons. In a nation ruled by a military junta with a history of ruthless oppression of opposition, being a satirist can be a dangerous job. Zarganar’s comedy had already seen him imprisoned four times. In 1988 he spent a year in the notorious Insein prison. In 1990, during the democratic elections won by Aung Sun Suu Kyi but annulled by the ruling junta, he was convicted for four years for making political speeches. In 2006 Zarganar was banned indefinitely from performing in public or taking part in any kind of entertainment. Then, in May 2008, Cyclone Nagris devastated the Irrawaddy delta. A million people were made homeless, up to 200,000 were missing or dead and one of Burma’s most populace and important agricultural regions was shattered. Despite the scale of the disaster – judged the worst in the nation’s history – the SLORC government blocked World Health Organisation and United Nation’s relief efforts. Inside Burma Zarganar organised 400 members of the Burmese entertainment industry to provide disaster relief to the cyclone-hit region. His teams of volunteers brought aid to 42 villages, some of which received no other aid. Following the disaster he was approached by foreign journalists to talk about the Irrawaddy disaster. On June 4, 2008 he was arrested for what he said to the journalists. For speaking against the government’s actions, Zarganar was convicted of “public order offences”. Such convictions normally have a maximum prison term of two years. In November 2008 Zarganar was sentenced to 59 years in jail. An appeal succeeded in reducing the sentence, but the comedian is facing 35 years in jail. It’s no joke. ICAF had taken up Zarganar’s cause and is working to raise the profile of his situation across the world. In 2008 ICAF nominated Zarganar for the Freedom to Create prize for Imprisoned Artists. He won and the financial assistance that came with the award has supported his family and provided him with food and medication in prison. Despite this help, Zarganar’s health is suffering. In April this year his family got word out that he is ill. He is in Myitkyina Prison, in the northern Kachin State – some 1,400 kilometres from his family – deliberately isolated, even though Burmese prisoners rely on their families to provide food and supplies. He recently lost consciousness in his cell for more than two hours on 16 April, and was only taken to Myitkyina hospital 10 days later. At that time doctors found that he had high blood pressure, spondylitis (inflammation of the joints of the spine) and an enlarged heart. Blood samples were taken, and tested at a larger hospital: these showed that he has developed hyperthyroidism (overactivity of the thyroid gland, which can cause heart problems). Zarganar has had a history of high blood pressure and stomach complaints which began before he was imprisoned. ICAF is campaigning for Zarganar’s release arguing that his imprisonment is in contravention of the UN Declaration of Human Rights – and they want your help. Below are some of the jokes that have landed Zarganar in jail. George Bush, Hu Jintao (China’s president) and Than Shwe (Myanmar’s military leader) went to visit God. God replied, “Not in your lifetime,” driving Bush to tears. Mr. Hu then asked when China would become the richest nation in the world, which drew the same ‘not in your lifetime’ answer from God and tears from the Chinese president. Enclosed with this magazine you will find a postcard like the one above – it is one of 200,000 produced by ICAF designed to make sure that the Myanmar government know that the international community is watching their treatment of Zarganar and that he is not alone. Please use your postcard. Let the Burmese generals know that we are watching them and that the international community of performers will not stand by while they persecute one of our own. If you are a comedy performer or manage a venue you can order a stock of these cards to distribute at your gigs – contact Louise McMullan at Guild House, lmcmullan@equity.org.uk or 020 7670 0226. Take a moment before or after your set to explain to your audience what is happening to Zarganar and why it’s important that they speak out. Order some cards and distribute them to your fellow performers. The more people know about this and take action, the more effective we will be. There will be many, no doubt, for whom Myanmar (or Burma) is just an exotic name for a far away place about which they know or care little. As Burma it was conquered by the British in 1824 and treated as part of the wider Indian Raj from 1886 – despite the very deep resentment of the local people. During the Second World War it was the scene of bitter battles between the Japanese and British armies and the end of the war saw the Union of Burma, a democratic republic, established as an independent state. In 1962 democratic rule ended when General Ne Win led a military coup. Ne Win would rule for 28 years and continue to exercise a strong grip on the country’s politics until his death in 2002. The military regime has, from the beginning, ruthlessly suppressed dissent. Demonstrations against the coup in Rangoon University in 1962 ended in the killing of 15 students. So-called “resident alien” populations – ethnic groups excluded from citizenship – have been the subject of repeated persecution – around 300,000 Burmese Indians fled the country in the aftermath of the coup and in the 1970s perhaps 200,000 Rohingya Muslims fled to poverty-stricken Bangladesh to escape the Burmese regime. In 1988 as communist regimes collapsed in Europe a pro-democracy movement known as the 8888 Uprising was crushed as security forces killed thousands of demonstrators. Using the confusion of the protests General Saw Maung staged another coup and introduced the State Law and Order Restoration Council (SLORC), creating a new constitution and instituting martial law. In 1990 Burma held its first free elections for almost 30 years. The National League for Democracy, led by Aung San Suu Kyi, won an overwhelming victory but SLORC refused to step down. SLORC remains in power today and has been led since 1992 by Than Shwe. Aung San Suu Kyi has been under house arrest since 1989. She was awarded the Nobel Peace Prize in 1991. She remains committed to peaceful protest against the regime – inspired by Buddhist teaching and the life of Mahatma Gandhi. She could go free at any time if she agreed to leave Burma. SLORC is promising to hold elections in 2010. To prevent Suu Kyi from taking part in those elections it has extended the term of her house arrest by 18 months. Persecution of minorities continues – over the past decade around 300,000 of the Karen people have been made homeless or escaped as refugees to Thailand. In August this year conflict on Burma’s northern border between ethnic Chinese and Kachin people saw 10,000 refugees flee into China’s Yunnan province. This entry was posted in Journalism, News and tagged arts, equity, Politics. Bookmark the permalink.